ARRIVAL: This is the ground approach to the proposed All Aboard Florida station in Fort Lauderdale. Architectural trusses are a design feature that will be echoed in all four of the railroad's stations. 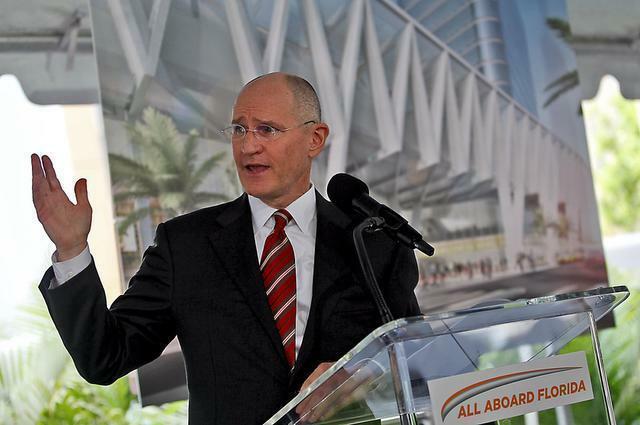 All Aboard Florida -- the fast passenger rail that will connect Miami to Orlando through Fort Lauderdale and West Palm Beach -- unveiled plans for its Fort Lauderdale station on Tuesday. The $30 million structure will straddle the Florida East Coast Railway tracks on Northwest Second Avenue between Broward Boulevard and Northeast Fourth Street, opening an overlooked and unattractive area near important downtown destinations to development and commerce. 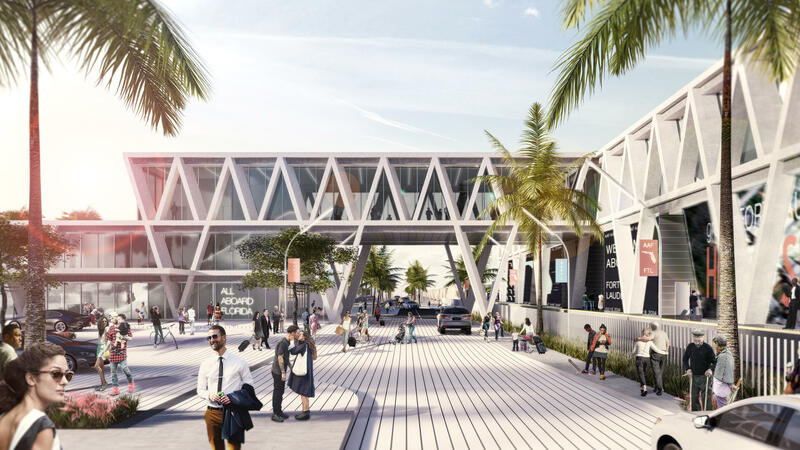 AAF officials said arriving passengers would find themselves within walking distance of the Government Center, the Himmarshee entertainment district, Las Olas Boulevard and the Broward Performing Arts Center. "The realty of multimodal transit integration and close proximity to key destinations are the magic characteristics that set this location up for long term success," said AAF president Michael Reininger. It's the second of the line's four stations to be unveiled at a public event. 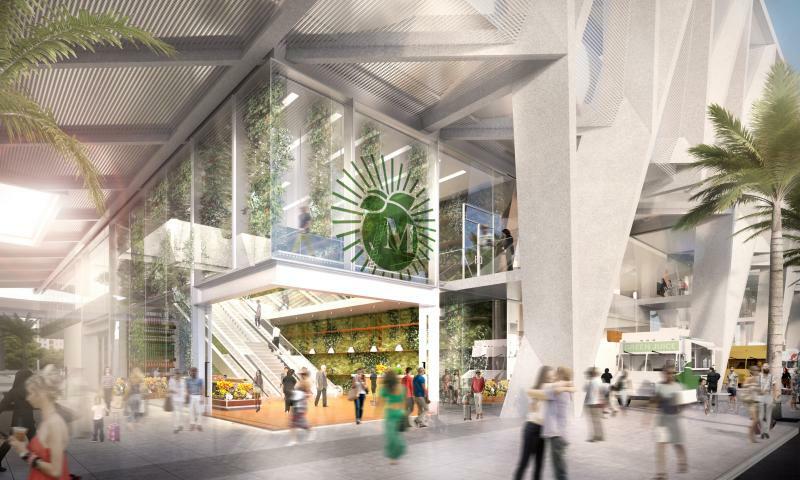 Renderings of the much larger and more elaborate Miami station were shown last month at the facility's future location in the shadow of Miami-Dade's downtown Government Center. The trains are expected to be rolling between Miami and West Palm Beach in late 2016. But uncertainty surrounds making the final connection to Orlando. Reininger said that will have to wait for the financing to be nailed down and that will depend on a positive environmental impact report from the state. Reininger says he has no doubt everything will fall into place. But even if Orlando falls through, he says, he'll still have a railroad. "We are willing to take the risks," Reininger said. "The first phase of this project is a robust business all by itself." 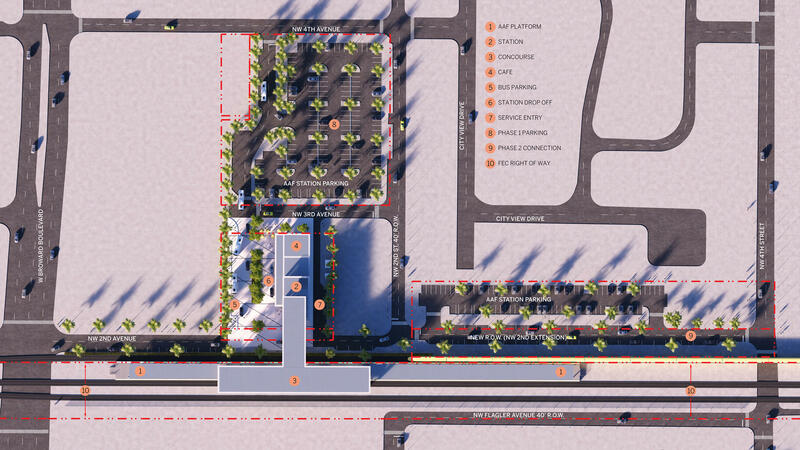 SITE MAP: Broward Boulevard is on the left. Click to enlarge. Economic impact projections for All Aboard Florida are grandiose: $6 billion to the state economy as a whole over the next eight years -- $333 million of that in Broward County alone -- and 10,000 new jobs. Like the Miami station, the Fort Lauderdale installation will contribute a vivid architectural presence to the city, an image that architect Bernard Zyscovich has no trouble imagining printed on coffee mugs and postcards. The station with its terminal and waiting areas will rise above the tracks with huge observation windows facing north and south for straight-on, giant's-eye views of arriving and departing trains. "You'll know you've arrived somewhere special. It will be visually exciting, like an oasis downtown," Zyscovich said. The excitement that city officials feel is for the economic boost and infusion of urban life they've been told to expect. But buffing up a forbidding, hardscrabble neighborhood right in the city center is also cause for enticement. The train station and its exterior accessories will replace a dusty strip mall on Northwest Second Avenue, where grim, Soviet-style apartment towers loom in the middle distance. "This area hasn't always been the first choice for people coming to town to put up our next office building or high-rise," said Fort Lauderdale Mayor Jack Seiler. "This is an area that will be developed and re-developed and we'll be talking about how it transformed Fort Lauderdale."